One of Merida’s greatest attributes is its centralized location in the Yucatan. That’s exactly why we list Yucatan day trips as #1 in our Top Things To Do in Merida Travel Guide. 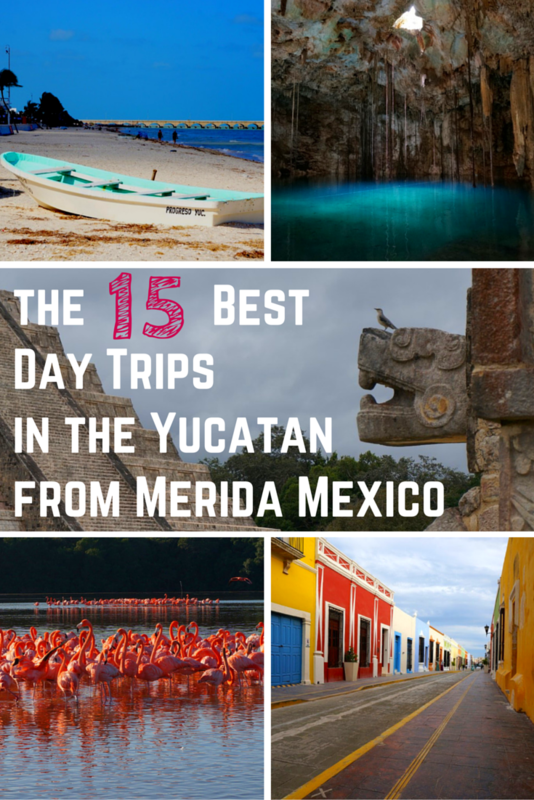 There are so many awesome day trips from Merida to tour the entire Yucatan region! You’ll discover an abundance of some of the Yucatan’s best beaches, Mayan ruins, cities, cenotes, and other attractions all scattered within close proximity to Merida. All of these day trips from Merida listed here are within a two-hour drive from Merida. There are enough worthwhile Merida day trips to fill an entire one or two-week Yucatan itinerary. Yet even with a few days basing yourself in Merida, you’ll be able to pack in many of these excursions, as you explore the many awesome adventures throughout the Yucatan! But it hasn’t always been easy to figure out where everything is located, how to get there, how much it all costs and what is actually worthwhile to visit. That’s why we decided to painstaking assemble this detailed travel guide of what we’ve found to be the best day trips from Merida. We hope that our effort of putting together this info-packed guide will help other Yucatan travelers to plan out their adventures and thoroughly enjoy the best of what the Yucatan has to offer! In each of the following Merida day trips, we provide suggestions for Merida tours and DIY directions. The Merida tour recommendations should prove helpful for those looking for convenience. Meanwhile, independent travelers and those traveling through the Yucatan on a budget will likely appreciate the detailed do-it-yourself directions. We show how to get to each of these locations on your own from Merida, using public transport or rental car. Having your own wheels is essential for a few of these Yucatan day trips from Merida. While other sites can be easily traveled to by public transportation or a Merida day tour. A day tour from Merida can be a seamless, and often still a very affordable way to visit other attractions. For each Merida day trip recommendation, we compare what we’ve found to be the best tours at the best prices. Sit back and leave all of the logistics to the Merida tour agency while you get scooped up directly from your hotel and have a guide to fill you with local knowledge along the way. But however you arrive to these intriguing destinations throughout the Yucatan, we do hope the following suggestions for Merida day trips are helpful to your travel planning! And here’s a handy map to refer back to. (If you’re doing some travel planning, you may want to bookmark this page.) If you get lost in this big info-laden post, simply scroll back up to the top here and use this map or the table of contents to help find your way. There are numerous Mayan ruin sites all throughout the Yucatan peninsula. The recommendations below are what we firmly suggest as the best Mayan ruins near Merida. It includes a mix of the most popular Mayan ruins, in addition to a few lesser visited ruin sites near Merida that you can find off the beaten path. Chichen Itza is the most famous Mayan ruins near Merida. Come and gawk at the enormous Castillo (Kuklakan) temple. Chichen Itza boasts several accolades such as being the largest Mayan archaeological site in the Yucatan, a designated UNESCO World Heritage site, and one of the New Seven Wonders of the World. But with all of these superlatives, Chichen Itza has become the most popular Mayan ruin site in the region. It attracts quite the crowds and vendors. Don’t let this deter you from a visit though. Simply plan to arrive early, right when Chichen Itza opens, or even a bit before. There are no crowds at Chichen Itza in the early morning hours. Most of those annoying hawkers haven’t even arrived yet. This calm and cooler environment makes for a much more pleasant visit. Chichen Itza opens at 8:00 am and can be virtually empty until 9:00 or 10:00. Crowds really begin to arrive around 11:00. Noon-3:00 is always the busiest time to visit Chichen Itza. This is when tourist hoards arrive from getting busses in from the Cancun resorts and the Cozumel cruise port, which is a few hours away to the east. It takes 2½ hours to reach Chichen Itza from Cancun, but Merida enjoys a much closer position with a drive of less than 90 minutes. So when coming from Merida, it’s easy to be among the first few people into these impressive Mayan ruins near Merida. Coming in the morning, visitors can expect no crowds, no pesky vendors, and it’s without that harsh midday Yucatan heat when all the tour buses arrive from the Riviera Maya. If you have your own means of transportation, we would suggest planning to get to Chichen Itza around 7:45. Or take this small group Chichen Itza Dexluxe tour which departs at 7:00am (confirm times), arriving to Chichen Itza before all the large group tours show up. 🌮 Food: Snack vendors and decent Oxtun restaurant onsite. 🎒 Pack: Sunscreen, umbrella, bug spray, water, camera, hat, sneakers, cash, and pack patience if you arrive in the afternoon. While it’s possible to get from Merida to Chichen Itza using the following four ways, we recommend to either rent a car or take a Chichen Itza day tour from Merida. 🚗 Self-drive from Merida to Chichen Itza: It is an easy and direct route from Merida to Chichen Itza using the very nice highway 180D, which has hefty tolls of $95 pesos, each way. The drive takes about 90 minutes if things go smoothly, but you may want to budget for two hours, pending traffic departing Merida. Parking fees at Chichen Itza are an additional $30 pesos. Exact driving directions: here on GoogleMaps. 🚕 Taxi from Merida to Chichen Itza: Try to negotiate a $1,000 pesos round-trip fare for a taxi from Merida to Chichen Itza that includes a few hours waiting time at the ruins. Expect to cover tolls ($180 pesos) and parking fee ($30 pesos) in addition to the taxi fare. Once you factor in admission ($242-pesos) and lunch, you can expect the total cost to well exceed US$100 for a couple, even if a good taxi fare is negotiated. We believe a tour or rental car is a better option. 🚌 Bus from Merida to Chichen Itza: Buses from Merida to Chichen Itza depart from both the CAME and Noreste terminals for the approximately 2-hour ride. Second-class buses start around $70 pesos each way, while the ADO bus from Merida to Chichen Itza is $150 each way. There are typically 3-4 ADO buses that depart Merida in the morning hours. (Check ado.com.mx for an up-to-date timetable.) The problem with the ADO bus is that there is only one return bus from Chichen Itza to Merida each day, which is not until 5:30 pm in the afternoon, leaving you at the sweltering ruins for a longer time then needed. We instead recommend considering the Your Way Shuttle Bus to Chichen Itza (check here for schedule and availability). It’s a great deal since it’s only a few dollars more than the ADO bus, but this shuttle bus further includes an access pass to the adjacent Mayaland Resort and pool! There’s a private entrance between the resort and the ruins, so it’s easy to use that pool to cool off before returning to Merida. Book it on Expedia. 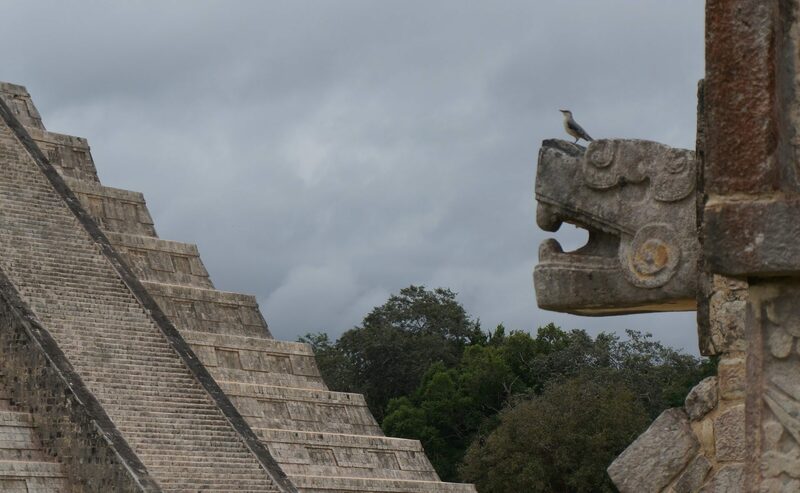 🚐 Chichen Itza Day Tours from Merida: Chichen Itza day trips from Merida can present good value, given the convenience and all that is included in the price. For example, the Chichen Itza Deluxe Tour from Merida includes admission to the ruins, full lunch, resort pool access at the ruins, and a professional guided tour of Chichen Itza. The early pick-up helps to ensure you get to Chichen Itza before the influx of Cancun tour groups arrive. Prices recently dropped to $75, a bargain given everything that’s included, but check current prices to confirm. Chitzen Itza tours from Merida can be a good option for a day trip to Chichen Itza, not only for the convenience but because you’ll also get an informative guide who will explain the many details about this impressive ancient site. Yet it’s all the extras that really add value, as some day trips even detour to nearby cenotes before returning Merida. All tours mentioned below include access to Mayaland Resort, in which you can use their private entrance to Chichen Itza and free use of their pool. Pack a bathing suit! Uxmal is arguably the best Mayan ruins near Merida to visit. The Mayan ruins of Uxmal are the other major Mayan ruin site within easy reach of Merida. It’s our favorite Mayan ruins near Merida to roam around and we highly recommend. Go to Uxmal to learn all about the importance of Rain God Chaac to the Mayan inhabitants who once thrived here centuries ago. This ancient Mayan site, built between 700-1,000 AD, was a massive city of 25,000 people living here in the dry jungle of the Yucatan. Today the well-preserved ruins give a glimpse deep into Mayan history, allowing visitors to immerse themselves throughout the intricate complex that is now a UNESCO World Heritage Site. Unlike at Chichen Itza, it is permitted to actually climb atop and even inside many of the ruins at Uxmal. This makes for a fun experience and some incredible views! Gaze down and imagine what this impressive site must have been like when the Mayans ruled the land. The Uxmal ruins are much less trafficked than Chichen Itza, yet are still moderately popular in the afternoons. Arriving early is a good idea to beat any crowds, but it’s really not as big of a concern compared to Chichen Itza. Mornings are still a good bet though, more so to beat the heat. In the video below, you can get an idea of the (lack of) crowds, during our last visit to the ruins in June 2018, around the late morning (10:00-Noon). 🌮 Food: Onsite snack bar and nearby restaurants at hotels. 🎒 Pack: Sunscreen, umbrella, bug spray, water (lots! ), hat, camera, sneakers, and cash. Uxmal is an easy day trip from Merida. To get from Merida to Uxmal, driving, buses, and day tours to Uxmal are all great and viable options to consider. 🚗 Drive from Merida to Uxmal: It’s a straight shot on good roadways that should take slightly more than an hour to reach Uxmal. Consider driving through the town of Muna, not around it using the bypass. Muna has mirador (viewpoint) and it’s worth stopping there for both the views and to take a look at Pedro’s artwork. Parking at Uxmal is $30-pesos. Exact driving directions are here on Google Maps. 🚌 Merida to Uxmal Bus: Buses depart from Merida’s Terminal de Segunda Clase (TAME) bus station for the ~1.5-hour journey. The fare is $65 pesos each way. The timetable at time of writing shows departures from Merida to Uxmal at 6:00, 9:00, 10:40, 12:00, 14:35, 17:00, and 18.05. There are five return buses from Uxmal to Merida that depart roughly every 2-3 hours. You can plan your departure time for approximately a two-hour visit to Uxmal. 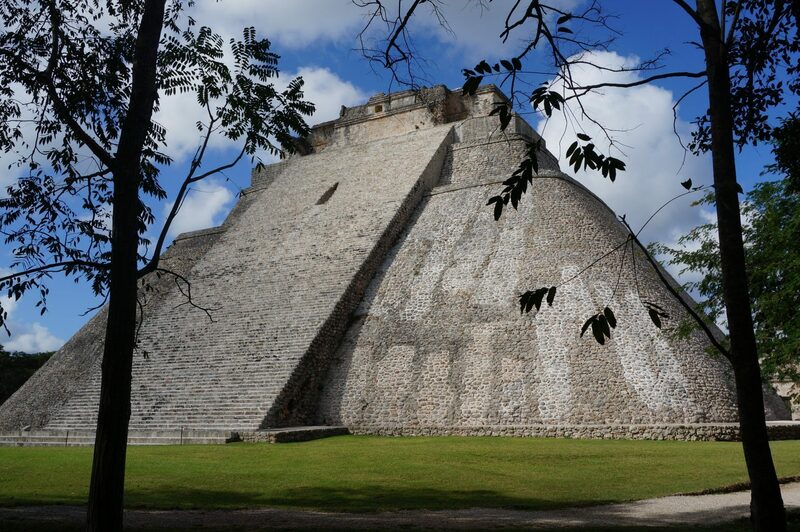 Day tours to Uxmal can be a very convenient option, including hotel pick-ups, lunch, resort access to cool off in their pools, and to get all the knowledge that a guide can fill you in about the fascinating site. The tours can also be a good bet adding in stops to nearby Kabah and/or the Choc-Story museum. Below is a comparison chart of two Uxmal tours from Merida that we can suggest. Be sure to click through the links to confirm up-to-date details, see the latest reviews, and verify pricing. About 25 miles outside of Merida are the majestic Mayapan ruins. These impressive Mayapan ruins are what we vouch are the most under-appreciated Mayan ruins near Merida. The site is not as large nor as popular as Uxmal or Chichen Itza. But that’s all part of Mayapan’s appeal. You will likely be able to enjoy the beauty of these Mayan ruins all to yourself. Take in the tranquility. 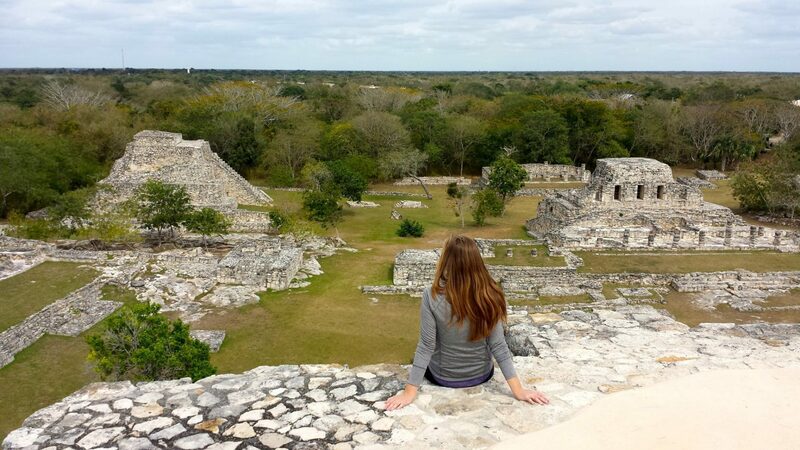 Be sure to climb all the way to the top of Temple of Kukulcan and get some postcard-worthy photos. At a mere $40-peso entrance fee, a visit to these ruins is of incredible value. And after frenzied experiences at other popular ruin sites, you’ll be treated to a quiet and serene experience at Mayapan. 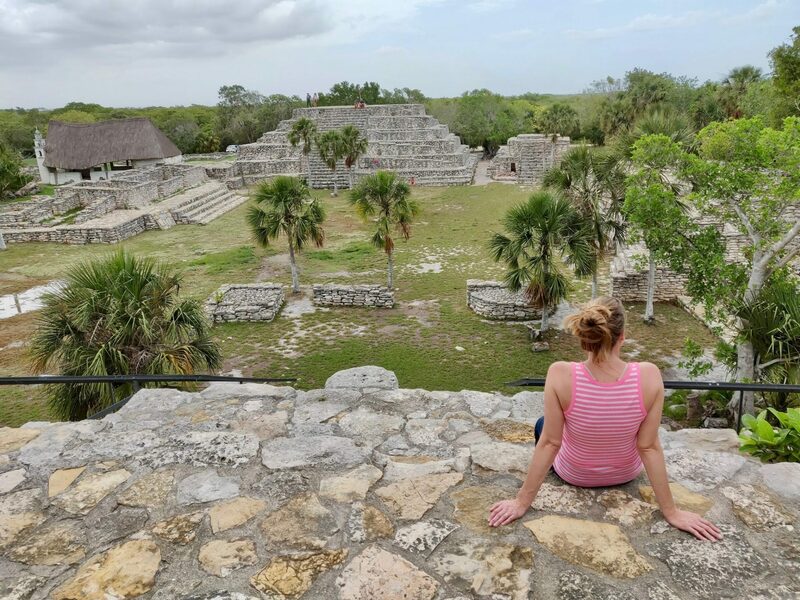 For all of these reasons, we put the Mayapan ruins firmly amidst the best day trips from Merida. And it’s among the closest Mayan ruins sites near Merida too! 🌮 Food: Nothing onsite and not much around. If you have a car, consider lunch at El Príncipe Tutul Xiu in Mani, a 35-drive to the south. It can be a little tricky to take the bus from Merida to the Mayapan ruins, but it’s doable. Mayapan is better approached by rental car or day tour. 🚗 Self-drive from Merida to Mayapan Ruins: Taking state road 184 south will enable you to reach Mayapan in under an hour. 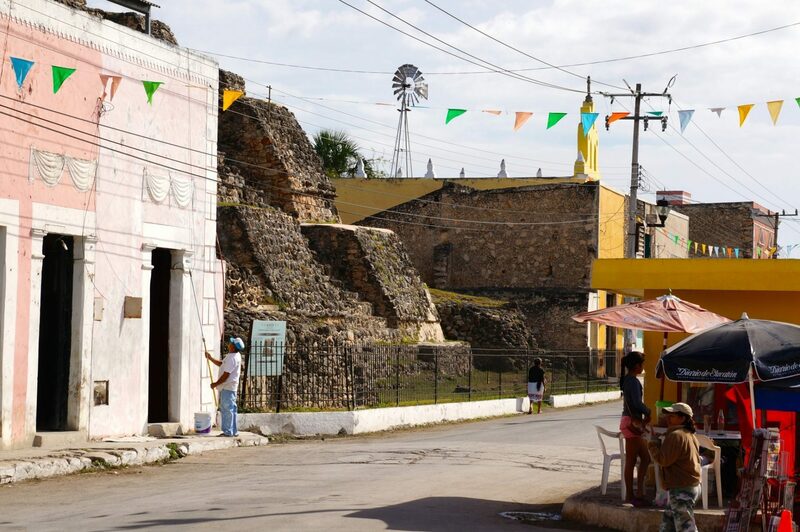 You’ll see clearly marked signs for Mayapan, just a bit past the town of Telchaquillo. Consider stopping at the town of Acanceh, which is on the way. (There’s more about Acanceh later in this blog post.) Exact driving directions to Mayapan ruins are: here on Google Maps. 🚌 Bus from Merida to Mayapan Ruins: Use the Noreste bus terminal, located here at Calle 67 and Calle 50. Buy a ticket on the Telchaquillo bus, which will get you close to the Mayapan ruins. Be sure not to confuse the ruins of Mayapán with the village of Mayapán, which is a completely different place that shares the same name. Say “ruinas de Mayapán” or “zona archeologica de Mayapán.” The bus cost is $25 pesos each-way and departures and returns run about every hour. As this is a 2nd class bus, it makes many stops and will take about 1.5 hours to get to the Mayapan ruins. 🚐 Day Tour from Merida to Mayapan Ruins: Although we think a visit to Mayapan is very worthwhile, it is not a common or popular day tour from Merida, so you may have trouble finding an operator who offers it. This new (2018) Mayapan tour on Viator is an affordable option that also includes a visit to the Mayan town of Acanceh and a nearby cenote. It’s excellent value to at $44. Check current prices, availability, and latest reviews. 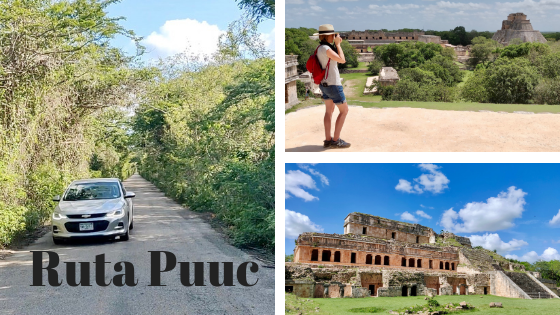 The Ruta Puuc is a great driving route for anyone wanting to explore some of the lesser visited Mayan ruins near Merida. Coast across the hilly and forested terrain and you’ll pass by three separate Mayan ruin sites. This includes Sayil, Xlapak, and Labna. Each site has its own unique features and feel. Labna has its impressive and elaborate arch that is not to be missed. The Xlapak palace may be smaller than neighboring sites but has a wild feel to the unrestored mounds that remain. Meanwhile, Sayil sports a rugged atmosphere with an impressive palace and other structures. Each of the three Mayan ruin complexes has short trails connecting different ruins to one another. While nearby Uxmal and Kabah are largely exposed to the sun, the jungle canopy of trees throughout the Ruta Puuc offers a welcomed reprieve and truly provides a sense of exploration. It’s that sense of discovery of these more wild ruins and the lack of anyone else here, that makes the Ruta Puuc such a worthwhile day trip from Merida to embark on. If visiting these three Mayan ruin sites along the Ruta Puuc from east to west, you’ll then reach the Mayan ruins of Kabah. This site is bigger and grander than the previous three and it’s logical to also include a stop at Kabah while touring the Ruta Puuc. Some consider Kabah as a part of the Ruta Puuc too. It’s here at Kabah that you’ll find the former administrative structure of Codz Poop and the hundreds of detailed Chaac masks that still adorn the building today. 🕒 Ruta Puuc Hours: 8 am – 5 pm for all four sites. The Ruta Puuc road remains open 24 hours. 🌮 Food: Nothing along the Ruta Puuc route or ruin sites. We suggest lunch at the Pickled Onion in Santa Elena. Nearby: It’s worthwhile to consider further extending your Ruta Puuc road trip to culminate at Uxmal. We believe that the Ruta Puuc is best experienced by car. Yet there are some limited bus and day tour options from Merida for those who may be uncomfortable driving the Ruta Puuc. 🚗 Drive from Merida to the Ruta Puuc: We suggest beginning on the east side, starting with Labna, which should take 1½-2 hours. From Merida to Ruta Puuc, take 184 towards Oxkutzcab. From there, it’s another 15-minute drive up 31 to the Ruta Puuc turnoff, which is clearly signposted. Continue on the Ruta Puuc to Labna, Xlapak, then, Sayil. Consider further continuing to Kabah and Uxmal to pack in a very full day of Mayan ruins from Merida. Exact directions from Merida to the recommended east turn-off for Ruta Puuc is here on Google Maps. 🚌 Ruta Puuc Bus from Merida: Oriente Bus operates on Sundays only, departing at 8:00 am and stops at all three sites on the Ruta Puuc for 30-minutes each. The bus continues onto Kabah (40-minute stop) and Uxmal (2-hour stop). The price is $280 pesos per person, plus all admission fees at your own expense (+$469 pesos for all 5 sites). This totals $749 pesos + lunch expense for the Sunday outing. This Ruta Puuc bus returns to Merida around 5:00 pm. The bus departs from the Terminal de Segunda Clase (TAME station) on calle 69 between 68 and 70. 🚐 Ruta Puuc Adventure Tour from Merida: There is a more formal small group tour to the Ruta Puuc and Loltun Caves that runs every day of the week and includes transportation and guide to the three Ruta Puuc sites plus the Loltun Caves for $62 USD. This makes for a nice full day of adventure from Merida. The Dzibilchaltun Ruins may not be as large as Chichen Itza, as impressive as Uxmal, as intimate as Mayapan, or as much of an adventure as the Ruta Puuc drive. But the Dzibilchaltun ruins are the closest Mayan ruins to Merida, includes an artifact-filled museum and an even onsite exposed cenote that you can swim in. Another appeal of Dzibilchaltun is that you are permitted to climb up some of the temples here. So while it may not hold quite the esteem as some of the aforementioned Mayan ruins sites, Dzibilchaltun still makes for a very worthwhile half-day trip from Merida. We recommend Dzibilchaltun for convenience, given it’s close proximity to Merida. Dzibilchaltun is so close to Merida, that on a clear day, you can even see the skyline of Merida off in the distance! And if you happen to be in the Yucatan during an equinox (around March 21 or September 22), it is highly advisable to visit the Dzibilchaltun Ruins at sunrise to witness the Templo de las Siete Munecas light up, making the doors of the temple glow since they are perfectly aligned with the sun. While most of the other Mayan ruin sites in this guide are full-day excursions, Dzibilchaltun can be easily visited from Merida in a half day. If going to Dzibilchaltun on a hot day (which is just about every day), be sure to bring your bathing suit to take a swim in the refreshing waters of Cenote Xlakah. 💵 Dzibilchaltun Entrance Fee: $152 pesos, for combined entrance to ruins + cenote, also includes the museum. 🕒 Dzibilchaltun Hours: 8 am – 5 pm, but cenote closes at 3:30 pm. Museum closed on Mondays. 🌮 Food: Drinks and snack bar onsite near the entrance. Being the closest ruins near Merida, Dzibilchaltun makes an easy day trip from Merida that can be reached using any of the following options. Tip on best time to go to Dzibilchaltun: To have a more tranquil experience, avoid busier weekends and avoid days that cruises are in port at Progreso (check Progreso cruise schedule here). 🚗 Driving from Merida to Dzibilchaltun: Depending on traffic, you can reach Dzibilchaltun from Merida in less than a half hour, although planning for 30-45 minutes may be more realistic. It’s $20 pesos for parking at Dzibilchaltun. The site is well signed and exact directions from Merida centro are here on Google Maps. 🚌 Colectivos from Merida to Dzibilchaltun: Colectivos are frequent and depart from Parque San Juan. Check on Calle 69a and 67a, between Calle 62 and 64. Cost is $11 pesos for the 30-minute trip and you’ll get dropped off about 1 km from the ruin site. Then walk (or take a mototaxi) the remaining way to the ruins. 🚕 Uber/Taxis from Merida to Dzibilchaltun: An Uber estimate to Dzibilchaltun is about $200 pesos, each way, although you may have to negotiate with your Uber driver to wait there for the return trip since it is a bit far of a pick-up spot. Taxis have been known to do the round-trip from Merida to Dzibilchaltun for $250-$300 pesos including an hour or so of waiting time at Dzibilchaltun. The Mayan ruin sites listed above are what we recommend as the 5 best ruin sites from Merida to visit. But know that there are even more ruins near Merida and throughout the Yucatan. If you want to continue exploring the ancient Mayan world, you can consider visiting Xcambo and Oxkintok. These lesser visited ruin sites are best approached from Merida by car. The ruins of Oxkintok are said to be among the oldest in the area. There’s a well-preserved pyramid that you may be able to climb and even go inside. Located in the hills of the thick jungle, when driving to Oxkintok, be careful of the growth on the skinny road that will easily scratch your car. Oxkintok is very close to the Calcehtok Caves, 45-minutes west of Uxmal, and about an hour or so drive directly from Merida to Oxkintok. Open 8:00-5:00, entrance fee: $55 pesos, located here. The Mayan complex of Xcambo is an interesting detour to make if driving along the coast near Telchac Puerto. It’s certainly worthy of dropping in for an hour if already in the area, but this smaller ruin site of Xcambo may not justify a day trip from Merida onto itself. Xcambo is said to be a former fish curing and salt-producing center, which makes sense given its location near the coast. Xcambo is another ruin site that allows you to climb up the structures and you’ll likely be the only visitors. Open 8:00-4:30, entrance fee: $70 pesos, located here, about an hour and 15 minutes drive from Merida. The city itself is landlocked, so there are no Merida beaches, per se. Yet there are plenty of beaches all around Merida dotting the Yucatan coastline! These beaches near Merida may not have quite the large expanse of white sands as in Cancun and the Riviera Maya. But the beaches near Merida are very nice nonetheless. Even better, you’ll be able to enjoy a much more local beach experience near Merida, rather than tourist crowds or spring breakers often found at the sprawling resorts on the other side of the peninsula. The beaches near Merida also tend not to be bombarded by the influx of Sargasso seaweed that often affects Mexico’s Caribbean beaches. An added appeal of the beaches near Merida is that you’ll pay a fraction of the cost at restaurants and hotels on these Gulf Coast beaches, compared to the Yucatan peninsula’s eastern shores. A day at the beach makes for an easy and excellent trip day from Merida. So which beach near Merida to go to? A short 27 miles from Merida, is the tranquil beach town of Progreso. This makes Progesso the closest beach near Merida. It’s even easily possible to reach Progreso beach from Merida Centro in less than an hour! For those looking for a relaxing day trip from Merida, a day at Progreso beach is a perfect idea. Go here to escape the city heat and to have some fun in the sun. In Progreso, you can take a dip in the warm Gulf of Mexico waters while marveling at the longest pier in the world. Take a stroll down Progreso’s mile-long malecon lining the shorefront to work up an appetite. When it’s time for lunch, find one of the many seaside restaurants to devour some fresh local seafood. Or pull up a plastic chair at one of the abundant palapa restaurants on the beach to kick back a few cervezas while you bury your toes in the sand. This is what Progreso beach is all about. 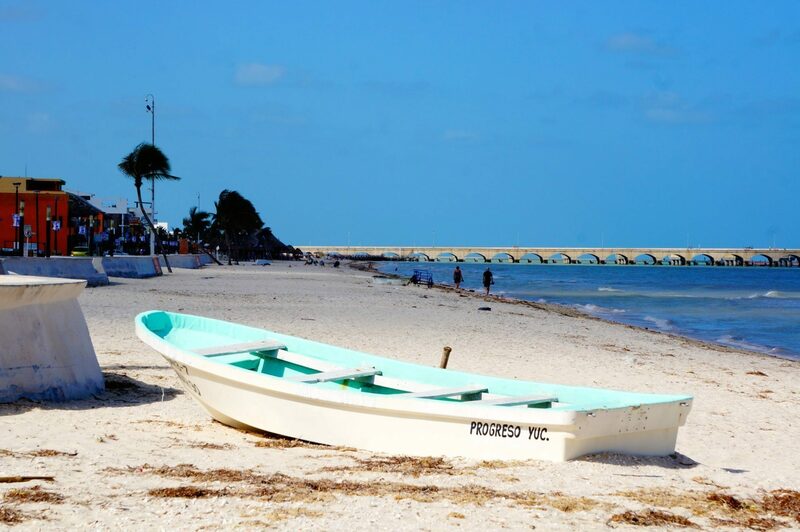 So where to grab some seafood and a beer while chilling out on Progreso beach? There are endless opportunities. 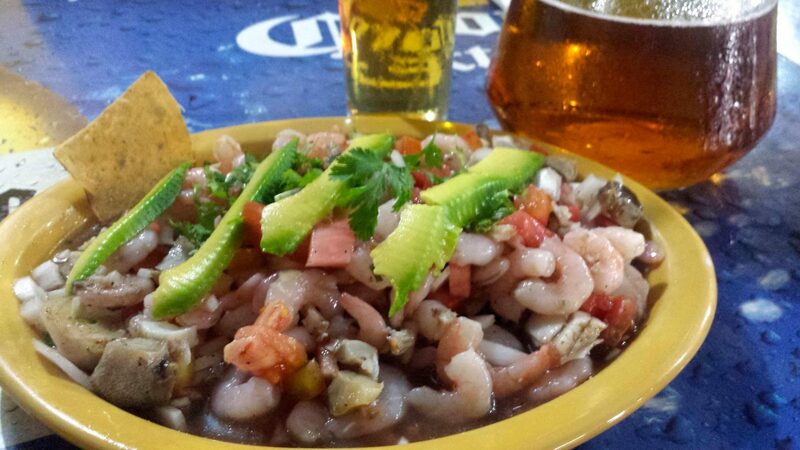 We can personally recommend Sol y Mar for their delicious ceviche and they’ve been known to run a ceviche promotion that includes a pitcher of beer. Also, the Eladio’s location right on the beach is excellent. The beers at Eladios are slightly overpriced but they more than make up for it with the extremely generous platefuls of bontanas (Mexican tapas) that are delivered to your table complimentary. Expat favorite, Milk Bar, is always fun to pop into whether for a shake or a beer. While roaming around Progreso, consider taking a side trip to El Corchito. 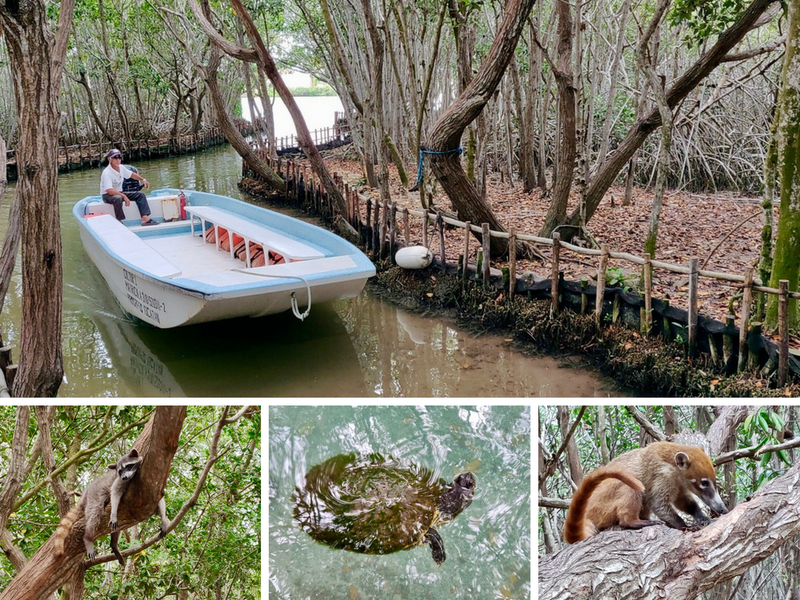 A mere $35 pesos grants entrance to this eco-reserve, including a boat ride across a lagoon and into a mangrove tunnel. Great value! It feels worlds away from Progreso beach as you are immersed in this natural environment where local critters are known to hang out. Expect to see raccoons, coatis, and fresh-water turtles. Speaking of fresh water, there are three exposed cenotes at El Corchito to swim in. If the beach gets too hot or windy, El Corchito can make for a most pleasant retreat to swim around in the clear fresh waters among the friendly wildlife. The boats to El Corchito depart from here, which takes about a 30-minute walk from Progreso beach or a very quick taxi or drive. The mosquitos love El Corchito just as much as the lazy raccoons and coatis, so definitely pack some natural bug repellent like this. Tip to beat the crowds at Progreso Beach: Understand that Progreso is a port for Carnival Cruise ships. These cruises tend to come 1-3 days each week. Plan your visit to Progreso beach when a Carnival cruise is not in port to avoid a heavy influx of visitors, higher prices at some restaurants, and an abundance of people searching for shore excursions in Progreso. So check this Progreso cruise ship schedule to see which days a ship may be in port during the time you’re visiting. Avoid those days if possible. Also, Progreso beach gets packed with Merida residents over the weekends, particularly so during hottest summer months. Consider a weekday visit if you want a more tranquil beach experience. Yet we find that the local weekend crowds give Progreso a fun & festive atmosphere. Fiesta! The closest beach to Merida is easy to get to. We recommend to either drive or take the very frequent bus to Progreso beach. 🚗 Self-Drive from Merida to Progreso Mexico: If you have a car, it’s an easy straight shot up highway 261. Once you’re out of the city, it’s about a 20-30 minute drive to Progreso beach. But plan for at least 45 minutes if you’re departing from Merida centro. 🚌 Bus from Merida to Progreso Mexico: There’s a very convenient bus from Merida to Progreso, operated by AutoProgreso, that runs every 10 minutes between 5:15 am to 10 pm. The price is $20 pesos one-way or $36 pesos round-trip. Catch the bus from Merida to Progreso from the AutoProgreso terminal on calle 62 between 65 and 67. 🚐 Tour from Merida to Progreso: A day tour to Progreso really isn’t necessary. The AutoProgreso buses running every 10 minutes make Progreso easy and inexpensive to get to from Merida. But for those who are more comfortable with having a guide, consider this Dzibilchaltun Ruins & Progreso Beach tour ($63). Celestun is a sleepy fishing town on the western side of the Yucatan peninsula. The beaches are decent and you’ll likely have them all to yourself. Beachfront restaurants serve up fresh-caught seafood. Meanwhile, inexpensive hotels offer fantastic value to the trickle of travelers who decide to stay in Celestun overnight. It’s one of the rare places around the world where you can score a nice beachfront hotel with an ocean view room for only $30! Check availability at the beachfront Hotel San Julio. But the real draw to Celestun beach is the eco-tour boat trip through the Reserva de la Biosfera Ría Celestun. This is where you can find thousands of wild flamingos that tend to flock here in the winter months and into the spring. If you poke around the swampland on the road leading into Celestun, you may be lucky to spot a few of the pink birds. But if you really want to see thousands of flamingos flocking and squawking, you’ll want to take the two-hour boat tour around the Celestun River Biosphere Reserve. 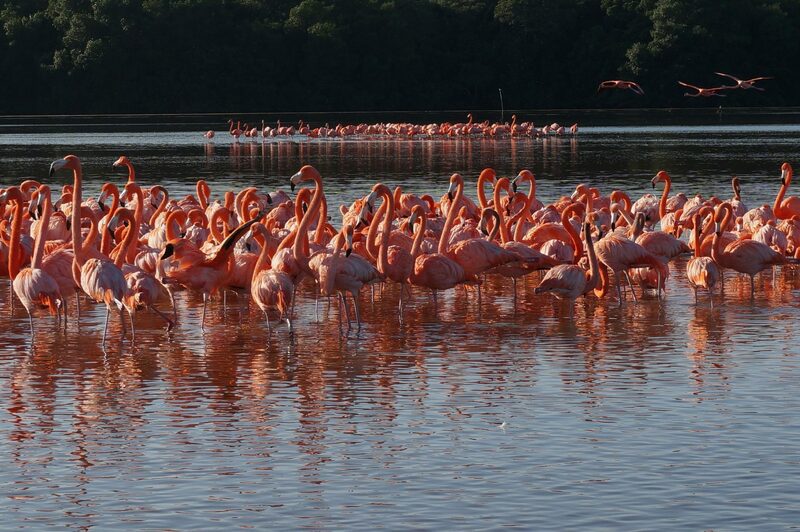 For any nature lovers visiting the Yucatan, seeing the flamingos in Celestun is a must-do day trip from Merida! See what our boat tour of Celestun was like when we first visited in 2014. If you arrive at the docks on your own, the 2-hour boat tour will cost $1,500 pesos but you can split that cost with up to 6 other people since the boats fit 7 passengers total. You’ll have a chance of paying as little as $215 pesos per person if there happens to be the perfect amount of other people to join you on the boat. But this is not a hugely popular tour. So there is a realistic possibility that you may arrive at the boat docks and find no one else there to split the costs. Tip: It is said that the flamingos are most active in the morning, so you may opt to drive to Celestun the evening before and stay overnight in order to be there to catch an early boat in the morning. 🚗 Self-drive from Merida to Celestun: From Merida it’s about a 90-minute car ride westbound on Highway 281. The docks for the boat tour are well sign-posted, on the left, about 1.5 km before you reach Celestun’s beaches. Here is the exact location of where you can catch the boats for the flamingo tour: on Google Maps. 🚌 Bus from Merida to Celestun: You can take a bus to Celestuun from Merida’s Noreste bus terminal on Calle 50 at 67. The bus departs hourly from 5:00 am to 8:00 pm. The cost is $56 pesos each way. If visiting only for the boat tour at the Reserva de la Biosfera Ría Celestun, ask the bus driver if he can drop you off there. Otherwise you’ll be dropped off near the beach and will need to backtrack by walking (or take a taxi) 1.5 km to the boat docks at the Reserve. If looking for a beach day near Merida, the aforementioned Progreso and Celestun are the two clear favorite beaches for ease, convenience, facilities, and nearby attractions. Yet there are a few more beaches near Merida you can consider for those who want to explore deeper. The locations of these beaches near Merida are each marked on the map that’s embedded at the beginning and end of this post. 🏖️ Chelem: This beach is a 20-minute drive west of Progreso is this small little beach town that is growing in popularity with expats. 🏖️ Chicxulub Puerto: Almost an extension of Progreso, the Chicxulub beach lies 8 km to the east of its more developed neighbor. The beaches around Chicxulub are skinnier here with high tide often bringing the ocean up close to the many beachfront properties that line the shore. Unlike Progreso, the shorter pier here is open to the public. 🏖️ Sisal: This is perhaps the most out-of-the-way beach from Merida, as it isn’t connected to any of the other barrier beaches by road. But those who do take the hour+ drive from Merida Centro, will be rewarded with tranquility at the beach in this sleepy port town. 🏖️ Telchac Puerto: Further east from Progreso, it’s about a half-hour drive from Progreso to reach the small beach Telchac, which has some facilities and a central pier you can walk out on. The beach isn’t anything distinctly different from the others, but there are some other interesting and worthwhile natural attractions nearby. The road from Progreso towards Telchac is along a lagoon, rather than the beach. As you approach Telhac, there are a few spots along the way where you can find pink lagoons and even flamingos (although not in abundance as in Celestun). It’s just across from the lagoon from the Xcambo ruins. See the map for exact location. A quintessential and very unique experience in the Yucatan is visiting one of the many cenotes throughout the peninsula. Taking a dip in these natural underground swimming holes can be an otherworldly and refreshing experience. There are hundreds of cenotes within close proximity to Merida. So what are the best cenotes around Merida to visit? That’s a matter of opinion and can be subject of fierce debate among travelers to Merida. We’ve listed our favorites below. Get underground! If you were to only visit one set of cenotes, our recommendation is to go to the Cuzama cenotes. The cenotes themselves are impressive. Yet half the fun of visiting the Cuzama cenotes is the process of getting there. Your means of transportation is by using a mining cart that’s pulled by a horse! It’s an exhilarating and bumpy experience. There are three different cenotes to explore as the horse-drawn cart brings you to each one. This horse-cart ride to the cenotes is such an awesomely unique adventure in the Yucatan! Don’t just admire the cenotes though. To really experience them in full, you’ll need to jump on in. Bring a mask and snorkel to be able to see the beautiful dark blue abyss below along with interesting rock formations. If you had to ask us to pin down an absolute favorite Yucatan day trip, we may vouch for this one. You can the adventure of the horse cart, the scenery of the dry jungle, and the clear illuminated water of the cenotes themselves, which is refreshing under the hot Yucatan sun. It’s all a magical day trip from Merida. 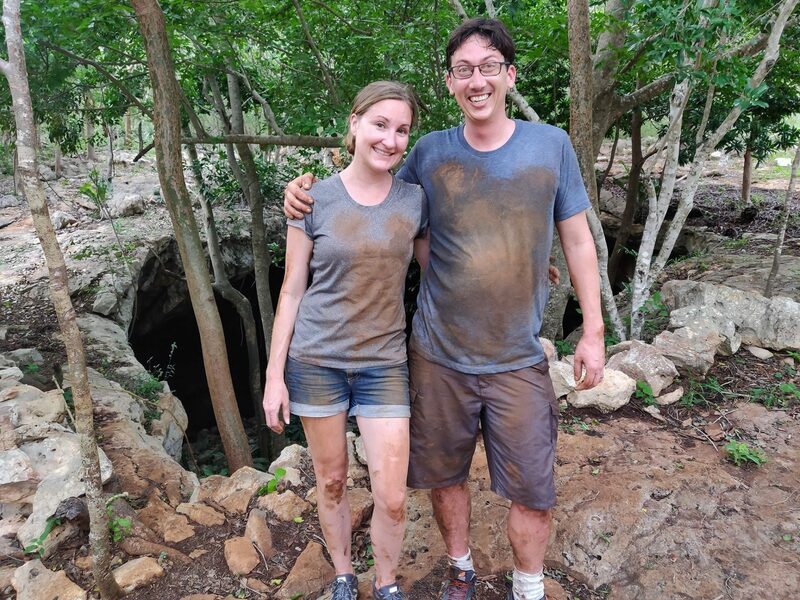 Here’s our full blog post from our first visit to the Cuzama cenotes. 💵Cuzama Cenote Entrance Fee: $400 pesos per cart at X’Tohil and Cuzama. $300-pesos at Chunkanán. 🕒Cuzama Cenote Hours: 8 am – 5 pm. 🌮 Food: Snack bar and cold beverages available onsite. There are three completely separate cenote complexes around Cuzama run by three entirely different cooperatives: X’Tohil, Cuzama, and Chunkanán. It is very easy to get them confused with one another. All three Cuzama cenote cooperatives provide similar experiences with a horse-pulled cart ride, yet they simply visit different cenotes. Competition is fierce and you’ll experience people flagging you in as you approach. We’ve personally been to two of the three (Cuzama and Chunkanán) and found experiences at both to be similarly great and have heard the same about the other (X’Tohil). So which of the Cuzama cenotes to go to? That’s entirely up to you. There’s really no bad option. The cenotes at all complexes are fascinating and each has their own appeal. These recommendations may help you to decide. On a tight budget: We recommend Chunkanán, as it is $100-pesos less than the other two. Longest horse-cart ride: We suggest Cuzama cenotes as it gives you the most time being pulled around on the carts. Coming by public transport: We advise X’Tohil, as it’s most convenient to reach by bus or colectivo from Merida. 🚗 Self-Driving from Merida to Cuzama Cenotes: From Merida Centro it takes about an hour or so to reach Cuzama. Directions are here on Goolge Maps. Those directions take you past the X’Tohil Cenotes, to the center of Cuzama town. Make a right, to head towards Chunkanán. Within a few kilometers, you’ll see a Cuzama cenote complex on your right. Another kilometer or so past that is the final Cuzama cenote complex of Chunkanan. You’ll have no problem finding any of the three sites as there are ample flaggers and even kids on bikes directing you. 🚌 Colectivo or Bus from Merida to Cuzama Cenotes: Buses to the town of Cuzama depart the Noreste terminal, located here on calle 67 and 50. The bus to Cuzama costs $20 pesos each way and takes 1.5 hours. The Cuzama buses depart at these times: 7:45, 9:15, 10:45, 12:30 and 14:30 (at last check, times may change). Alternatively, there are colectivos that depart across the street from the Noreste terminal on calle 67. If you are using public transport to reach Cuzama, you may want to ask the driver to drop you off at the X’Tohil cenotes before reaching the town of Cuzama. Otherwise, you’ll need to walk or take a motor taxi the additional 2+ km south of the town, to reach the other Cuzama cenotes. 🚕 Taxi from Merida to Cuzama Cenotes: From the taxi stand at Santa Ana in Merida, expect to pay $1,000 pesos round trip from Merida to Cuzama, including waiting time. But it may require some negotiating to reach that rate. 🚐 Day Tour of Cuzama Cenotes: You can book this well-priced adventure tour to the Cuzama cenotes ($64 USD) that includes hotel pick-up, guide, the horse ride, all entrances, a visit to the town of Acanceh and even lunch too! There are so many great cenotes all around Merida. There must be over a hundred of them, if not a thousand! Some are very well-known and packed with people, while others are located on private property. There’s even a handful of hidden cenotes scattered around Merida not written about anywhere. We stumbled across one of these secret cenotes near the small town of Tekit. There were no signs and no entrance fees. Just a drive down a dirt road, park, and you’ll have a private oasis completely to yourself. Go on an adventure and discover your own off-the-beaten-path cenotes while in the Yucatan. Visiting a centote is one of the best day trips you can take from Merida. To attempt writing about each of the best cenotes in the Yucatan would demand another article entirely. Instead, we’ll round-up some of our favorite and most popular cenotes near Merida. Cenote San Ignacio: Perhaps not one of the nicest cenotes, but it’s one of the closest cenotes from Merida, about 30 minutes away, and has an onsite restaurant. Cenote X’batun: Beautiful cenote located off highway 261, just past Hacienda Yaxcopoil, about 45 minutes drive from Merida. Cenote Xlacah: Exposed cenote located at Dzibichaltun (see Dzibichaltun section of this guide for more info) that’s worth a jump in after exploring the ruins. Cenote Kankirixche: Blue-water cenote located about 50-minutes drive south of Merida. Homun Cenotes: There are so many cenotes all around the town of Homun, about 1:15 hours’ drive from Merida: Cenote Tza-Ujan-Kat, Santa Rosa, Santa Maria, Santa Barbara, San Antonio, Yax Balcaltun, and more! Cenote X’keken and Samula (Dzitznup): Visit these cenotes near Valladolid. (See the Valladolid section that follows for more info). 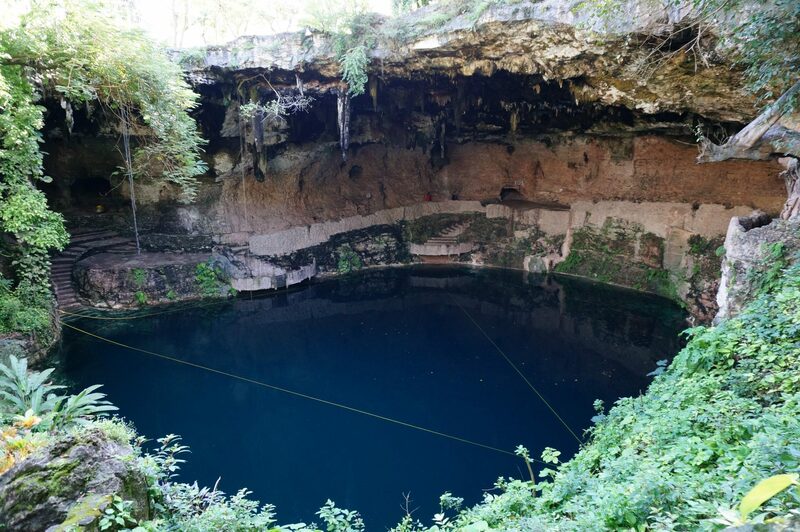 Cenote Zaci: Visit this cenote right in the middle of Valladolid. (See the Valladolid section for more info). Ik-Kil: Visit this scenic and very popular and scenic cenote near Chichen Itza. Most all cenotes mentioned above are best reached by car. Some require traveling down a dirt road, as you can see in the short video below which shows the road to Cenote Kankirixche. Meanwhile, Cenote Zaci is within Valladolid and hence can easily be walked to. Similarly, the Dzitznup cenotes are a short cycle or cab ride from Valladolid. Most others will require your own wheels to get to. If you’re ready for high adventure, then get low into Yucatan’s largest cave systems, which are just a short drive away from Merida! Grutas de Calcehtok is the largest dry-cave system in the Yucatan. Yet when approaching this cave, it looks like nothing more than a hole in the ground. Local guides lead you on private tours of the cave system, based on the level of adventure you feel most comfortable with: easy, adventure, or extreme! We chose “adventure,” which we felt to be pretty extreme to us (and we’ve done a lot of caving around the world). Here at Calcehtok, there were no helmets, no harnesses, yet down you go! 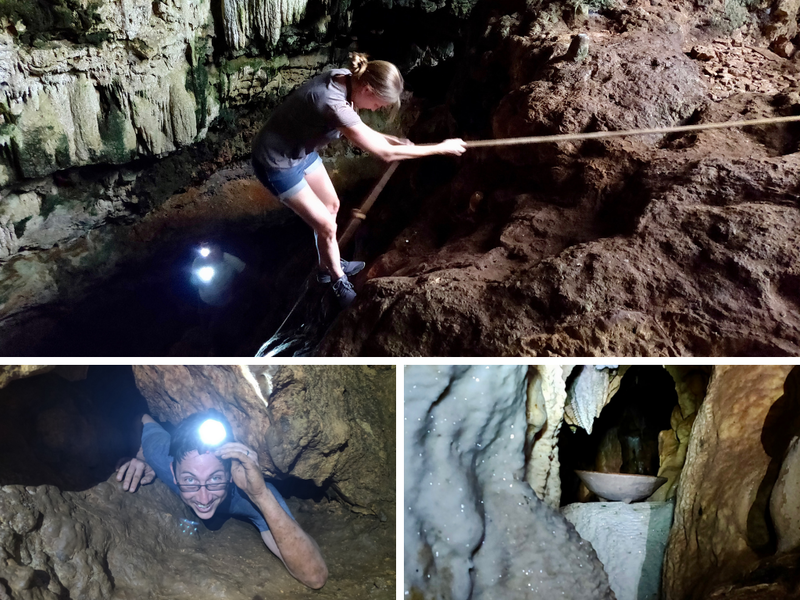 During the adventure tour, it was about two hours spent underground, crawling through the tightest of passages and hopelessly getting stuck at times. This is not for anyone who is even mildly claustrophobic. The payoff of making it through these tight squeezes is not just a sense of accomplishment. We were further rewarded by gazing upon ancient Mayan relics and even the remains of sacrificial sites that have been preserved deep in this cave, untouched for thousands of years. This cave experience is a bit crazy and only for the adventurous. It goes down as an all-time favorite adventure in the Yucatan! Wear old clothes. You will get filthy. 💵Grutas de Calcehtok Entrance Fee: We were charged $250 (total for the both of us) for a nearly 2-hour adventure tour. 🕒Grutas de Calcehtok Hours: 9 am – 5 pm, but guides may depart earlier if there are no customers. 🌮 Food: Nothing onsite and not much nearby. 🎒 Pack: Don’t bring much with you, as it could get lost or destroyed. Wear old clothes and sneakers. Headlamps provided. 🚗 Self-Drive (best method) from Merida to Grutas de Calcehtok: 75 Km Southwest of Merida off highway 184, just past the town of Calcehtok. Be careful driving there, as there is a turn-off for another cave that is part of the Calcehtok system, called X-Pukil, which is incorrectly marked as Grutas de Calcehtok on Google Maps. X-Pukil may also be a great experience but we’ve yet to investigate. So we can only provide our account for Calcehtok, in which you’ll need to look for the turn-off towards the Oxkintok ruins, both of which are clearly signposted. This is the exact location of the Calcehtok Caves we ventured to. The Loltun Caves are another dry-cave system in the Yucatan. The cave is most known for the amount of ancient Mayan artifacts that have been discovered in the cave, as well as murals by the ancient people. The cave can only be entered via a tour that departs at 9:30am, 11am, 12:30pm, 2pm, 3pm, and 4pm. The tours (one hour and 20 minutes) are usually in Spanish, but can be in English if that is the majority of the language of the people in the tour group. The Grutas de Loltun are often visited as part of the Ruta Puuc, as they are located near the end of the route. 💵Loltun Caves Entrance Fee: $124 pesos plus tip in which the guides will suggest an amount. They’ve been known to attempt to ask for $600-$800 pesos in tips for a group. We suggest $100 pesos per person and work this out with your guide in advance. +$22-pesos for parking. The Loltun Caves are the only caves that can be reached by a day tour from Merida and we’d recommend that or to self-drive. Although it is possible to reach these caves, with a little extra effort by using colectivos plus a taxi. 🚗 Self-drive from Merida to Grutas de Loltun: Access Loltun from Oxkitzcab, taking 261 to Muna, then 184 to Oxkitzcab, to make a right on 31 to Grutas de Lotun. 🚌 Bus from Merida to Grutas de Loltun: Second-class buses depart from the Noreste Terminal in Merida to the nearby city of Oxkutzcab (8:30 am). The price is $38 pesos for the 1.5-hour trip. There are also regularly colectivos ($55-pesos) departing from Parque San Juan on calle 69 to Oxkutzcab. 🚕 Once at Oxkutzcab, you must take a taxi the remainder of the 7Km to the Loltun Caves ($120 pesos roundtrip). 🚐 Grutas de Loltun Day Tour from Merida: This tour visits the Loltun Caves and the Ruta Puuc ruins all in one day. The $65 USD price includes lunch, all entrance fees, and guide. The Tzabnah Caves are another adventurous approach to caving near Merida. For this one, you’re provided a hard hat and we soon found out why this was needed. As you walk through the Tzabnah Caves, crouching is necessary for most of the way and it is so easy to hit your head as the ceiling begins closing in. It’s about a one-kilometer walk, each way, through this hot and muggy cave. You will encounter bats hanging from the ceiling, which take flight when startled. Also, there are about a dozen cenote pools along the way, which contain shrimp and fish that you can see near the surface with a flashlight. Towards the end of this cave, the space tightens as you’re forced to crawl on your hands and knees to get to the final cenote. We found ourselves dripping with sweat by the time we reached it, so we were relieved to be able to swim in this one. Most refreshing! 💵Grutas de Tzabnah Entrance Fee: $30 pesos per person for entrance and guide. 🚽 Toilets: Yes, but very simple. 🌮 Food: Nothing onsite, but options exist in Tecoh. 🎒 Pack: Bathing suit to swim in final cenote, drinking water, natural insect repellent, waterproof camera. The Tzabnah Caves are best approached by car. 🚗 Drive from Merida to Grutas Tzabnah: It’s about a 45-minute drive from Merida Centro, located just south of the town of Tecoh. The exact location of the caves is here on Google Maps. Throughout the Yucatan you’ll find a number of interesting towns to poke around. These are big cities like the impressive Campeche to smaller hidden gems not listed in the guidebooks, such as Acanceh. Whether big or small, they all are very friendly and worthy of exploring. Visit the recommendations listed below to discover which cities may clique with you. 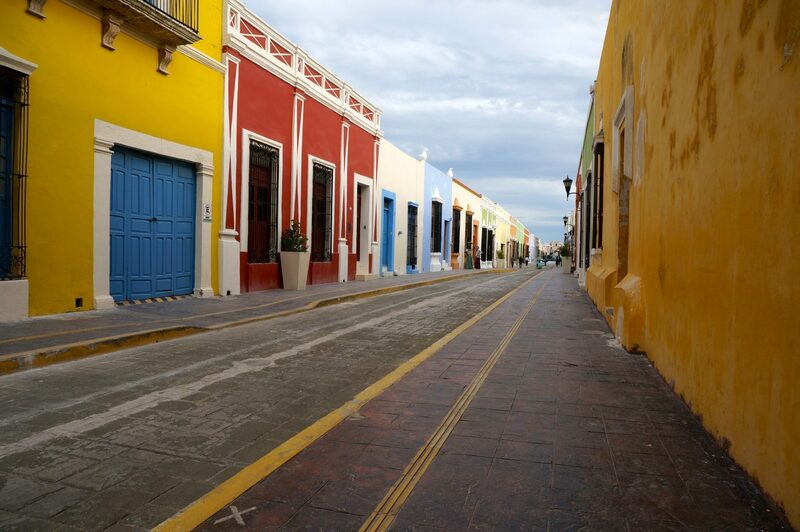 Campeche is a stunning seaside city with colorful architecture and fascinating history. The historic city is a designated UNESCO heritage site, only about a two-hour drive from Merida. The historic center of Campeche is surrounded by a two-mile wall that was built in the 1600’s to protect the city from invading pirates. Today, portions on the top of the walls are used by visitors to admire the beautiful view of the city. Explore the colorful buildings throughout the walled city and pop inside some of the fort’s bastions which have now been turned into museums and gardens. Climb atop the city’s walls for a birds-eye view or have a leisurely stroll along Campeche’s most-pleasant malecon. There is plenty to do in town. Here are our top 5 Things to do in Campeche. You may even want to make it more than a day trip from Merida, and stay for a night or two. 🚐 Drive from Merida to Campeche: It’s an easy 2-hour drive on the well-trodden Highway 180. Exact directions are on Google Maps here. 🚌 Bus from Merida to Campeche: There are frequent buses from Merida to Campeche. The duration is 2.5 to 3 hours and prices run from $138 pesos to $300 pesos, one way. Check ADO for up-to-date pricing and schedule. 🚐 Day Tour from Merida to Campeche: This day trip to Campeche ($69 USD) includes round-trip transportation, guide, admission fees, lunch, and a visit to the nearby Becal town along the way. 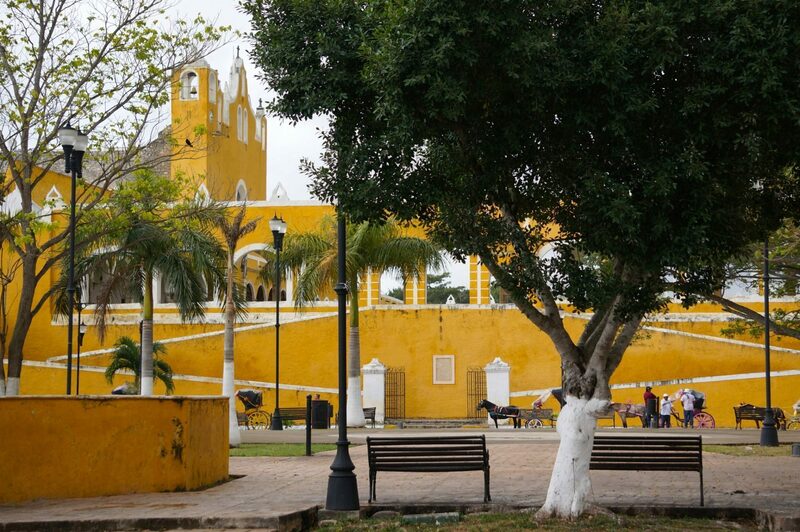 A short drive east of Merida is the picturesque city of Izamal. 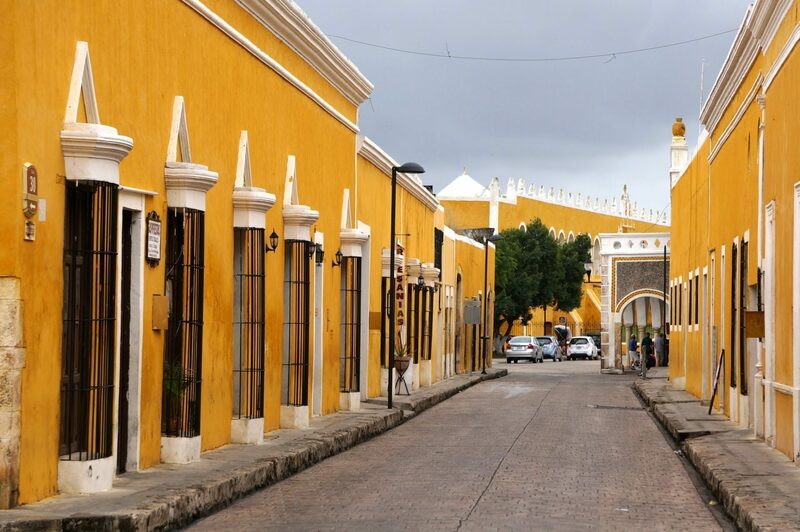 Known as the “Yellow City,” Izamal is a lovely place to spend hours strolling the streets and finding the ancient Mayan ruins which are interspersed all throughout town. Izamal may be one of the best day trips from Merida for photographers. You’ll love snapping photos of all the unique and bright yellow architecture found all over Izamal. The most notable building in Izamal is the monastery: Convento de San Antonio de Padua (free, $5 pesos to enter the museum 10am-1pm and 3pm-6pm Monday to Saturday, 9am-5pm on Sundays). Spaniards came here in the 14th century and destroyed a Mayan temple that was once on this site. They then used the stones of the temple to build the monastery! If you look, you’re still able to see carving designs from the former Mayan temple within the church stones. Also be sure to visit the Mayan pyramid of Kinich-Kakmo. It’s free (8am-5pm) and well worth trekking up the steep steps for the best panoramic view of Izamal! A good way to see all of Izamal is from a horse-drawn carriage. $200 pesos will get you an hour tour of this gorgeous yellow city. 🚗 Driving from Merida to Izamal: It’s about an hour drive Eastbound on 180. There’s plenty of free street parking around the monastery. Exact directions are here on Google Maps. 🚌 Bus from Merida to Izamal: There are frequent buses from the Noreste bus terminal (Calle 67 and Calle 50) for the 1.5-hour journey to Izamal. Price is $31 pesos one-way. 🚐 Day Tours from Merida to Izamal: This day tour to Izamal ($69 USD, GetYourGuide) includes hotel pick-up, horse-drawn carriage tour, climbing the pyramids, a visit to the convent, and even lunch at what we think is Izamal’s best restaurant, making for a perfect day in the yellow city. It only runs on Mondays, Wednesdays, and Fridays. Check availability for your dates. The quaint colonial town of Valladolid offers a backdrop of beautiful historic buildings, plazas, and even a cenote right in the middle of town. Relax in Valladolid’s pleasant square and admire the Church of San Bernardino. That’s a good place to start exploring the city, as there is an adjacent Palacio Municipal (Municipal Palace) which houses a tourism information office. Walk up the stairs above that office to get a birds-eye view of the plaza from the palace’s balcony. Take a walk down the Calzada de los Frailes to the Convent of San Bernardino of Siena, where you can tour this convent that dates back to the late 1500’s. Stop into the many boutiques along the way or wander over to one of Valladolid’s local markets. Be sure to dip into one of the town’s many restaurants to sample the local cuisine, such as lomitos de Valladolid, of which the city is known for this signature pork loin dish. And don’t miss the Cenote Zaci. 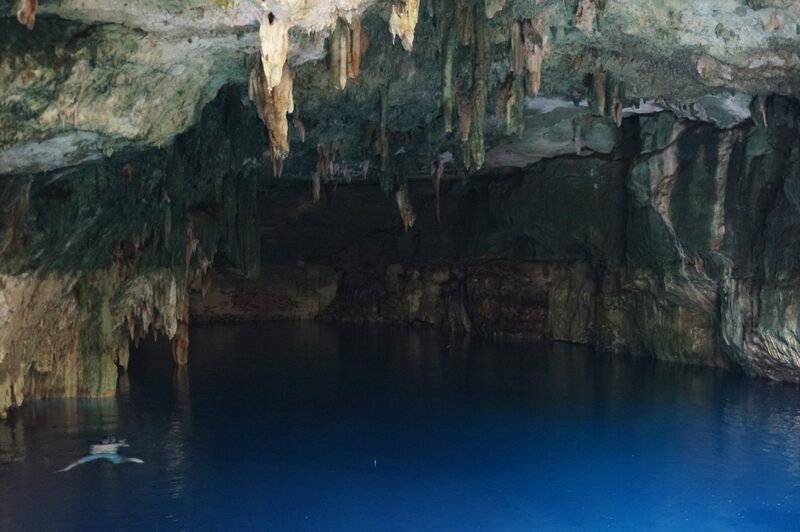 This beautiful blue cenote is situated right in the middle of town. Speaking of cenotes, consider combining a day trip to Valladolid to also visit Cenote Xkeken and Cenote Samula, which is located just a few kilometers outside of town. You can cycle to these cenotes from Valladolid. Otherwise, it’s a short and easy drive. It’s best to approach Valladolid by car or bus. Or even consider staying a night or two. 🚗 Drive from Merida to Valladolid: It’s about a two-hour drive from Merida to Valladolid using 180D toll road. The toll is $149 pesos each way. There is free street side parking around Valladolid. Exact directions are here on Google Maps. 🚌 Merida to Valladolid Bus: There are frequent ADO buses departing from the CAME bus terminal. It’s $110-$230 pesos one-way to for the 2:15-hour bus from Merida to Valladolid. Check the ADO website for up-to-date bus timetables and price. 🏨 Stay Overnight: If venturing out to Valladolid, it can be worth staying overnight. We always stay at the Colonial La Aurora Hotel. The lovely interior pool and courtyard is even more charming in person than the pictures. Try the breakfast on the rooftop patio. Best of all, this 3-star hotel presents excellent value at around USD$30 per night! Check availability and rates for Colonial La Aurora here. Acanceh is a small village located just 19 miles outside of Merida. The highlight of Acanceh is the ancient Mayan temple that’s integrated right within the town. You’ll also find a cathedral at the town square right across from the archeological site. 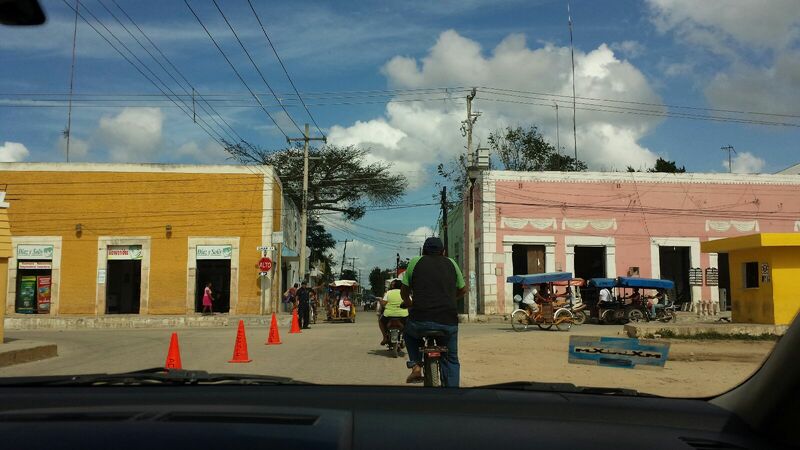 Acanceh is like a smaller, less traversed version of Izamal. It’s most certainly a worthwhile stop while in route to Cuzama, Mayapan, or other regional highlights. Yet it may not be worth a trip solely to visit this town on its own. So we recommend stopping at Acanceh on your way to another Yucatan location. Plan to spend about 30 minutes or so exploring the little town, visiting the cathedral, and admiring the pyramid, where you can often find a local to open up the gates to provide a brief impromptu tour for a few pesos. You will pass through Acanceh on the way to the Mayapan ruins or Cuzama. 🚗 Driving from Merida to Acanceh: It takes about 45-minutes from Merida centro to reach Acanceh using highway 180 & 184. Directions are here on Google Maps. 🚌 Bus from Merida to Acanceh: Buses depart from the Noreste Station located on Calle 67 between 50 and 52. The price is $24 pesos one-way. Buses leave about every few hours. You will find more frequent colectivos from Merida to Acanceh, across from the Noreste Station. 🚐 Day Tour to Acanceh: As this is not a major attraction on its own, there are no scheduled tours solely to Acanceh. However, tours to Cuzama and Mayapan do pass through Acanceh. This Mayapan tour on Viator makes a visit to Acanceh. So does this adventure tour to the Cuzama cenotes. Many of the best museums and cultural attractions in the Yucatan are located directly in Merida. See our Top Things to Do in Merida for several recommendations right within the city. Yet further afield, in addition to the museums and culture experienced at the ruin sites, we recommend a visit to the Choco-Story Museum near Uxmal and also the quintessential Yucatan experience of a hacienda visit. There are many haciendas near Merida that you can simply pop in to take a brief tour on your own. The Choco-Story museum is so much more than a museum about chocolate. What seems like a total tourist trap, located right across from Uxmal, is actually an extremely well-done museum that goes far beyond the story of chocolate. Mayans are credited with the discovery cocoa after all, so the museum does examine its origins here. But Choco-Story ultimately delves deep into the Mayan civilization and culture, which we found to be more in-depth and informative than the onsite museum at neighboring Uxmal, or any of the other ruin sites for that matter. Choco-Story has a unique layout too. This interactive museum is part eco-park, as it takes you into the Yucatan jungle. The museum is sprawled out across a number of open-air huts connected by trails. Choco-Story also operates as an animal rescue center, where they are caring for and rehabilitating jungle life such as jaguars that were discovered injured or illegally captured, hence cannot go back into the wild. So you’ll have an opportunity to see these native species that have been rescued. And halfway across the trails, don’t be surprised to find yourself ushered into a private Mayan ceremony. Cool experience! But a highlight, of course, is tasting the fresh hot chocolate drinks made from an ancestral recipe. There’s additional chocolate to taste, in the form of bars, when exiting through the gift shop. Located next to Uxmal, the Choco-Story Museum is an easy add-on during a day trip to Uxmal. And c’mon… it’s chocolate – yum! 🌮 Food: There’s a small cafe on-site, near the entrance. 🎒 Pack: camera, perhaps some bug spray, change for tips for demonstrations, and pack your sweet tooth! The Choco-Story Museum is located across the street from the entrance road to Uxmal, right here. 🚗 🚌 By Bus or Car: Follow the directions that were provided to Uxmal. 🚐 Day Tours to Choco-Museum from Merida: Some (not all) day tours from Merida to Uxmal make a stop at the Choco-Story Museum. We recommend this multi-stop tour of Uxmal that includes a visit to the Choco-Story Museum in addition to Uxmal, the Kabah ruins, a full lunch, and and the use of a resort pool to cool off. A quintessential Yucatan experience is visiting an old hacienda, making for one of the best day trips from Merida. Haciendas in the Yucatan are sprawling farming and manufacturing estates, that aren’t so dissimilar to plantations of the US South. The main crop produced at these Yucatan haciendas is henequen, used for its fiber, which led to a boom and subsequent wealth to the region in the late 1800’s and into the early 1900’s. With the Great Depression and the invention of synthetic fibers, most of these once-wealthy estates began to fall into disrepair by the early 1900’s. More recently there have been efforts to restore some of these haciendas to their former glory. As such, there are beautiful estates that have been transformed into 5-star luxury resorts and high-end restaurants. For those on a more modest budget, thankfully there are other haciendas near Merida that can simply be toured during the day to learn about their unique history and henequen production from over a century ago. 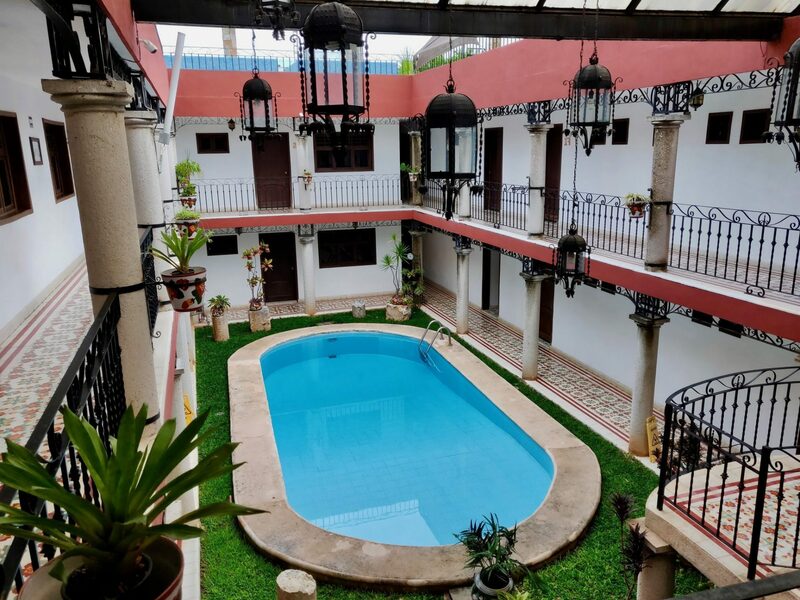 The following suggestions are what we’ve found to be among the most affordable, interesting, and easily accessible haciendas from Merida. The Yaxcopoil Hacienda dates back to the 1600’s and its Mayan name translates to “place of the green Alamo trees.”Yaxcopoil was considered to be one of the most important haciendas near Merida, for both its cattle ranches and its henequen production. This atmospheric hacienda has been handed down from generations from the family who owned it in the 1860’s. Their descendants have kept it well-preserved, as you can visit the hacienda today to view the famed Moorish double arch, the workshops, and even wander into the main building to see the period furnishings. Plan to tour the hacienda for about an hour. 🌮 Food: Small snack bar, not always open. Hacienda Yaxcopoil is an easy stop-off on the way to Uxmal and is best approached by car or tour. 🚗 Driving from Merida to Hacienda Yaxcopoil: It takes about a half hour or so to reach Hacienda Yaxcopoil from Merida centro. Directions are here on Google Maps. 🚐 Day Tour to Hacienda Yaxcopoil: This Hacienda Day Tour on Viator visits Yaxcopoil, two other haciendas, and two cenotes, packing in quite a lot for a modest price. Check current rates. Meanwhile, this Hacienda & Mayan Cooking Experience on GetYourGuide brings you to Hacienda Yaxcopoil before venturing to another hacienda for a cooking demonstration where you’ll then feast on your creations. Stop by this scenic hacienda to get a better understanding of henequin production. Hacienda Ochil includes grand Moorish archways, palm-tree lined rail tracks, artifacts from the boom days, and a lovely open-air restaurant that sits in the former casa principal. There’s also a small museum on-site and a cenote surrounded by an amphitheater. It all makes for some great photography opportunities. 🌮 Food: Full restaurant but sometimes is reserved full by tour groups. Hacienda San Pedro Ochil is another easy stop-off on the highway towards Uxmal and is best approached by car or tour. 🚗 Driving from Merida to Hacienda Ochil: It takes about a half hour or so to reach Hacienda Ochil from Merida centro. Directions are here on Google Maps. 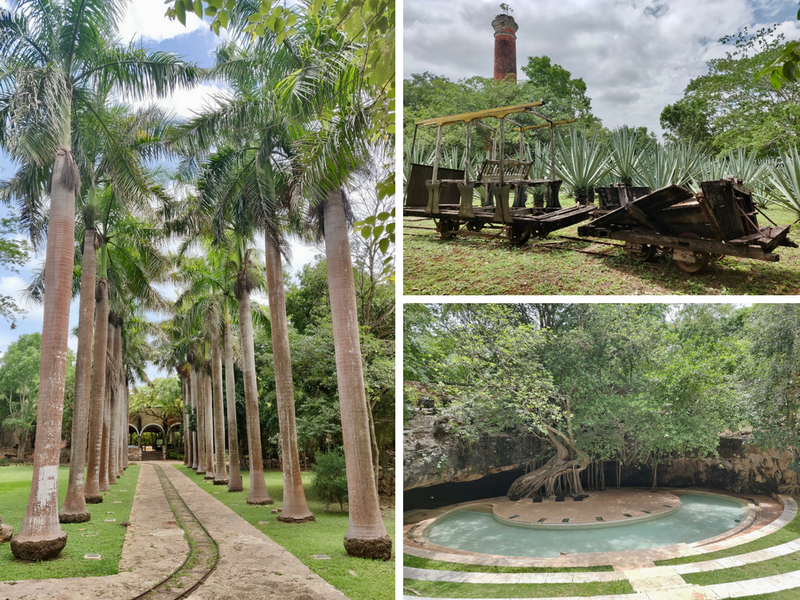 🚐 Day Tour to Hacienda San Pedro Ochil: This Hacienda Day Tour on Viator visits Hacienda San Pedro Ochil, the aforementioned Yaxcopoil, another hacienda, and two cenotes. Great way to see many haciendas in single day. Check current rates. Sotuta de Peón may be the most popular hacienda near Merida to visit. At $550 pesos, it also may be among the priciest to tour, yet it leaves many satisfied customers. Unlike the prior two haciendas where you can simply drop by, you must visit Sotuta se Peon as part of a tour. At Sotuta de Peon you can learn how a traditional hacienda operated back in the 1800’s. This hacienda has been immaculately restored to its former glory. In the heyday, Souta de Peon harvested mass quantities of fibers of the henequen plant, which was (and still is) planted throughout the property. In fact, Sotuta De Peon claims to be one of the only haciendas that still has the ability to process the henequen. The fibers from the plants are ultimately used to make various products here, such as rope, rugs, and handbags. The pricey tour of Hacienda Sotuta De Peon does include a cart ride pulled by mules and a visit to the cenotes on property, the Dzul-Ha Underground River. Consider coming for lunch. 🕒Hacienda Sotuta De Peon Hours: There are two 3.5-hour tours each day, at 10:00 am and 1:00 pm. Transportation from Merida leaves between 8:30-9:00 for the first tour while transport departs between 11:30-12:00 for the latter tour. 🚗 Driving from Merida to Sotuta de Peon: The drive from Merida takes about 45 minutes, pending traffic. Directions here on Google Maps. 🚐 Day tour to Sotuta de Peón: Tours depart from Merida hotels and other locations throughout the city. Visit their website for exact times and locations, or to make a reservation. Price for tour, lunch, and transport is $1,050 pesos. There are a few unique items you’ll want to bring with you for your Merida day trips. Many of these items are not available in or around Merida, so plan accordingly. Pack lots of dry-wicking clothing and a bathing suit, of course. If you will be swimming in cenotes, please consider the ecological implications that your sunscreen and insect repellent will have and come prepared with some of these suggested natural products. *Biodegradable* sunscreen is very important to bring if you plan to go into the area’s cenotes. Regular sunscreen can cause damage to the cenotes, kill the fish, and add chemicals to the fresh water. So please use biodegradable sunscreen, which can be difficult to find in Merida. This Alba Botanica Hawaiian Sunscreen SPF 45 is a great choice on Amazon, has consistently great reviews, and is inexpensive too. Natural mosquito repellent. Pesky mosquitos can be found in and around Merida. So if you’re susceptible to mosquito bites (like I am), bring some spray. This natural Repel Lemon-Eucalyptus repellent works well, isn’t as harsh on your skin, and better for the environment when you enter those freshwater cenotes all around Merida. Mask & snorkel – You may not think to pack this for landlocked Merida, but if you’re visiting any of the Yucatan’s cenotes, be sure to bring a mask & snorkel so you can see those fascinating underwater worlds that lie below the surface. This US Divers Mask is an excellent quality mask for its inexpensive price. Somewhat surprisingly, there aren’t any masks available for rent in most all the cenotes around Merida, so you must bring your own. How to pursue all of these various day trips from Merida is entirely dependent on your comfort level, the destinations you’re trying to reach, your budget, and personal preferences. For those comfortable with independent travel, public transportation can be a good consideration to get around Yucatan’s more connected destinations. Frequent buses make day trips to places like Progreso an easy journey. Yet for some of the more far-flung destinations, traveling by bus can be inefficient and difficult. It’s always cheap though! When using buses, be careful to note the departing terminal, as there are a few throughout Merida. There’s the ADO bus terminal, Segunda Clase (TAME), Noreste, and the AutoProgreso bus terminal to Progreso. Understand which one you need to get to your location. And be sure to know return times for less frequent routes. Rental cars in Merida can be very inexpensive if you book in advance. Renting a car can make for a good way to get around the region on your own terms. We’re often asked if it’s safe to drive around the Yucatan roads. That’s not easy to answer for readers we don’t personally know. Instead, we can offer our opinion, for ourselves. We feel comfortable behind the wheel in Merida and the Yucatan, but that’s a personal choice that each traveler has to make on their own. We find the Yucatan highways to be in very good condition. 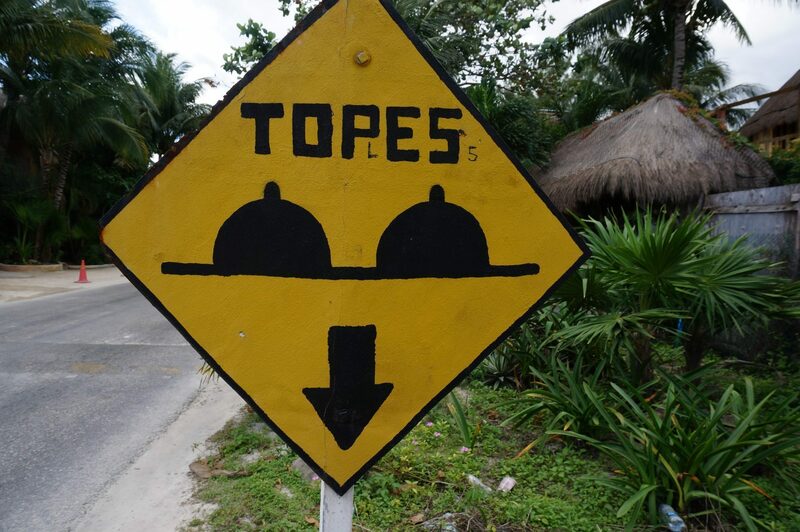 But in rural Yucatan, you will encounter hazards such as livestock, potholes, and steep “topes” (speed bumps), among other obstacles. Other considerations are Merida traffic, Spanish road signs, rental car insurance, and navigating through unfamiliar areas. Yet if you’re comfortable driving internationally, rental cars can be a great option to explore around Merida. For good deals on rental cars, we like to use the Priceline Rental Car Search, as we’ve used it to find rental cars in Merida at major agencies for as low as $5-USD per day and less! Most of the main rental car agencies (Budget, National, Alamo, etc.) have locations in Merida and they’re all listed on Priceline (often at lower prices than booking direct). Check the rates now. When reserving a rental car in Merida using Priceline (or any site), be sure to note whether the car you’re reserving is manual or automatic. The transmission is always listed, but sometimes it doesn’t stand out. So if you can’t drive manual, be careful to look for an automatic so you don’t show up to the rental agency and get stuck with a stick shift you’re unable to drive. Also, pay attention to the location you’re reserving a car. If you’re staying in Merida Centro, we recommend booking at one of the agencies on Calle 60 in between 55 & 57. National, Enterprise, Payless, and others are located there. Meanwhile the Plaza Americana area can also be convenient and has rental car agencies such as Hertz, Budget, Alamo and more. Be careful not to rent a car from the Merida airport, unless you want to pick it up when flying in, of course. If you don’t book in advance, usually the best prices we’ve found for a rental car on day-of tends to start around $500-$700 MXN ($25+ USD). For this day-of price, we’ve booked with an agency called EasyWay on Calle 60 and never had any problems. But you’ll likely save more by booking with one of the main agencies in advance. Search your travel dates on Priceline to see rental car deals for your trip. Jumping on a tour can be another great way to see some of the main sights of the Yucatan. Many of the tours from Merida are very competitively priced, offering full days of adventure for what can be minimal cost. It’s a seamless and easy way to comfortably be whisked around the main sights. But perhaps the best benefits of taking a day tour are some of the great guides who can fill you in with local knowledge, which you can’t get by traveling independently. So, where to book a day tour? There are agencies scattered throughout Merida that you can book day tours with once you’ve arrived in Merida. Often this can be the least expensive option for a tour, but it can come at the expense of taking the time to visit different agencies, discussing tours (sometimes in Spanish), and negotiating price. Tours also may even become fully booked during busy times like the busy winter high season in Merida. Instead, we recommend reserving your Merida day tours before arriving. 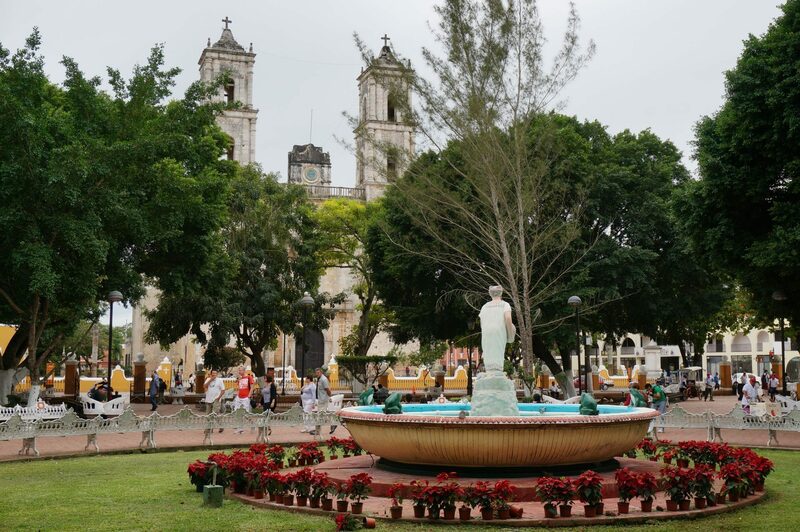 We love using Viator.com to book tours in Merida, because they offer such a wide variety of Merida tours, have 24-hour phone support in English, generous cancelation policies (usually free if canceled 7+ days), and have easy online booking (no emails or phone calls necessary). Viator also lists verified traveler reviews, so you can easily vet out the good tours from the not-so-good. They also have a low-price guarantee so you know you paid the cheapest rate. If you find a lower price once you arrive in Merida, Viator refunds the difference. Search all Viator tours from Merida for your travel dates. Yet, you may have noticed that we also listed Merida day tours from GetYourGuide throughout this post. GetYourGuide is another well-trusted website to find day trips in Merida, which also has a similar low-price guarantee and English customer support. GetYourGuide simply offers a different inventory of Merida day tours. Search all GetYourGuide tours from Merida. Some of the tours and pricing are different between the two competing websites, so it can be worth searching both to find day tours that best fits what you’re looking for. Although, we’ve tried to pick out what we’ve found to be the best day tour for the best price within each section of this travel guide. When comparing tours, be sure check the latest reviews so you can book a good tour with confidence. And be careful to pay attention to what’s included (meals, entrance fees, etc.) and what you’ll need to cover with your own pesos. Best Yucatan Day Trips from Merida? Have you been to any of these day trips from Merida? Which Yucatan adventure is your favorite or are you most excited to pursue? Please let us know in the comments. If you’ve found this Best Merida Day Trips travel guide to be helpful in planning your trip to the Yucatan, we’d love to hear from you. 🙂 Or feel free to ask us any questions about all these different day trips from Merida. Top 15 Things To Do in Merida Mexico offers several suggestions you can do from right within Merida. Best Restaurants in Merida provides what we think to be some great dining recommendations and also shows where to find all the best cheap eats in Merida! We realize there’s lots of information packed into this travel guide, so be sure to bookmark this page and come back again. Or use the pin below to save it to your Pinterest boards for later. Have a great trip to Merida and the Yucatan! 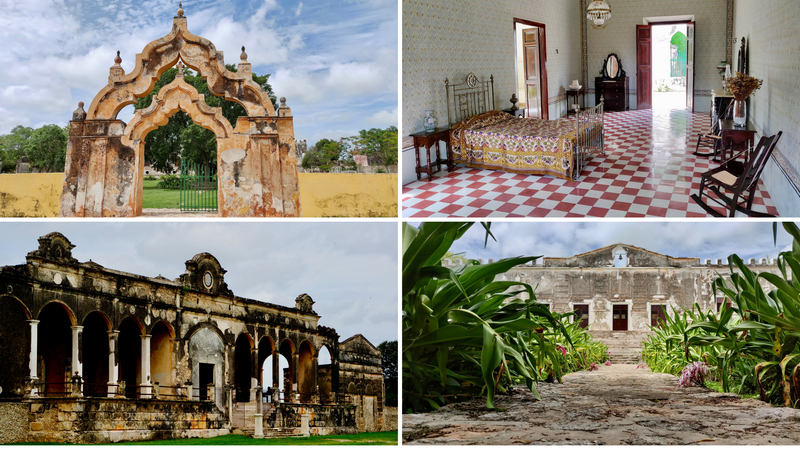 Publishing note: This Yucatan travel guide about Best Merida Day Trips was originally written in March 2016 and is continually updated, most recently in August 2018, immediately following our latest visit to the Yucatan. Awesome blog, thanks! I’m going to spend 2 weeks in the Yucatan, dividing my time between Merida and Valladolid, as my primary reason for visiting the Yucatan is to explore Maya sites. Would you recommend I split my time 50/50 between Merida and Valladolid? Or, is there much more to see and do in Merida than Valladolid? Again, my primary interest is visiting Maya sites and experiencing local culture, as I do speak Spanish and I’m something of a Maya history buff. Thanks!!! Our two cents… We’d recommend considering to spend more time in Merida compared to Valladolid. We love Valladolid and there are some great Mayan ruin sites around there (most notably, Chichen Itza, Ek Balam, and Coba.) Those are easy and ideal to reach within a few days or so, based in Valladolid. But Valladolid is much smaller compared to Merida, where you’ll find much more to do, making it worth more time there. Merida will likely prove to be a more ideal base for all the other ruins mentioned in this guide. And as a Mayan buff, you’ll definitely want to spend some time at Merida’s vast Mayan World museum, among others. You may also want to consider spending a night or two near Uxmal while exploring the Ruta Puuc. It’s worth it, in our opinion, to be able to spend more time at those major ruin sites south of Merida, rather than running back and forth between there and Merida. So with two full weeks, perhaps 3-4 days in Valladolid, a full week based in Merida, and a few days out by Uxmal and Ruta Puuc. You have covered the area very well. I might add one place: Isla of Arena out on the west coast is interesting, has a modern movie museum dedicated to a local movie star from the 40s and 50s, a few restaurants, cabanas and no one there. The drive out is through old hellequin plantations and a very long causeway through mangrove swamp-the drive is worth the trip. I think it is about a two hour drive from Merida. I wish you nothing but success! Unlike many travel blogs which are more focused on the writer, you offer a tremendous amount of help to the traveler. I’m planning a solo trip to Mérida next month and you have provided some great ideas and useful information. Keep traveling and keep writing! That’s so encouraging to hear! 🙂 Thanks so much for dropping us a comment to let us know. Hope you have a great trip to Merida and enjoy it to the fullest! We’re excited to be heading back to Mexico in the upcoming months to continue writing more travel info about this beautiful country! A car could get you there even earlier and you’ll have the autonomy to go at your own pace, both nice perks. But driving in the Yucatan can be intimidating for some and is not without some hassles. We’re totally comfortable driving around the Yucatan but others may not be. After departing Merida, the toll highway to Chichen Itza is fairly straightforward, but there’s always potential to get lost. You will encounter fee-based parking at Chichen Itza and potential ticket lines. A tour will have more simplicity and ease, in addition to an informative guide to provide more insight about the famous ancient site. They each have their pros and cons. Really it just comes down to which of the two methods you think you may prefer and may be more comfortable with. Hope that helps. Have a great trip! I have several questions about the Chichen Itza Early Tour that I cannot find answers to online. How do I email this tour operator? Hope you get the answers you’re looking for and have a great trip! I have been to 13 countries in the past 4 years and this is by far the best summary of adventures in any country, city or state that I have come across. Better than guidebooks. Thank you so much for being so thoughtful and thorough. I prefer public transit/colectivos and I can easily plan my trip based on your transportation advice. I am even considering renting a car and driving through Ruta Puuc- it seems like the experience of a lifetime. Thank you! Thanks so much for the kind and thoughtful feedback! Always makes us smile to read such sentiments. 🙂 We also tend to prefer using public transit. But it is nice to have the freedom of a car in the Yucatan too. Plus the cheap rentals and the semi-easy driving conditions make it such an attractive option too. Just watch out for the added rental insurance they’ll try to push on you. We love the Ruta Puuc! Hope you make it out that way and enjoy it to the fullest – happy travels! Hi – just wanted to say I know you posted this a while back but I just discovered this article. I am currently in Mérida for a while studying Spanish and this is the best summary of all of the sights to see that I have found. You put so much work into this and especially useful is the transport information by car or bus etc and the links to suggested tours. Thank you so much!! Helpful information. My wife and I plan on going late-2018 and this page will definitely help us plan our day trips. thank you for posting this. We’re thrilled that you found our guide helpful! Have a fantastic time exploring the Yucatan! Hello there! I spent a week in Merida and used many of your travel trips when I wanted to get out of Merida but not go too far. The Ruins and beaches were amazing! Your advice and descriptions of each activity was perfect! My favorite were the small but impressive Dzibilchaltun ruins, mainly because of the swimmable cenote there, and I wanted to give an update on how to get there. I went searching for the combis to the ruins, but they either were discontinued or only run on weekends or Sundays. So I found my own way, but thought I would keep you guys informed. Travel to Dzibilchaltun: Combis leave for Chablekal on Calle 65 and Calle 58 about every 15minutes for 10 pesos. Take the Combi all the way to Chablekal center and from there it’s a quick 10-15 pesos moto-taxi to the actual ruins. Repeat in opposite to return to Merida. So glad it’s helped! ¡Buen viaje! Thank you so much for all the wonderful info! Would you be willing to share an estimated daily cost of rental cars out of Merida (including insurance, fees, etc.)? So glad it’s helped! Every time we’ve rented a car in Merida, we’ve used the Easy Way Rental Car, located in Centro. They’ve tended to have the best walk-up rates among the couple of agencies that are located right next to each other in Centro. We’ve always had a fine experience using them, decent cars, and never had any issues. I can’t remember the exact amount we paid but it was around $500-600 pesos per day, including the necessary minimal coverage, for a compact automatic car. (We use our credit card which further covers us.) Hope that helps! Hi guys, I just wanted to say a big thanks for your blog – it has been so helpful to me, as a solo traveller without my own transportation. Keep up the awesome work!! So glad to hear it’s been helpful! Thanks for stopping by to let us know! 🙂 Have a great trip to the Yucatan! This is very helpful, particularly the “getting there” section. I am going to Merida tomorrow, and I found this blog is a quick guide for making my checklist to visit Merida. Fantastic! We’re always so glad to hear these guides are proving helpful. Thanks so much for stopping by and commenting to let us know. Have a great trip to Merida and exploring all around the Yucatan! This was really helpful and I referred back here every day on my 5 night Merida visit. Merida is a great city and the plentiful choices for day trips makes it a Primera destination. Thanks! Sotuta de Peon was AWESOME! We visited there on our trip in 2012 and we loved it. At the end there is a great cenote for swimming. My husband’s family lives near Chichen Itza and we’re taking our kids for their first visit to the ruins next week! Can’t wait to be back in Yucatán! Hey Renee! Thanks for the comment! How great is it that you can take a dip in a refreshing cenote after roaming around the hacienda? Have a great time exploring all the ruins with your kids and enjoy being back in the Yucatán! I’ve been to Mexico City twice, and we traveled all around Puebla, Mexico. Merida is our next stop, and this list is AMAZING! Thank you! Now I can fathom staying in Merida for 7 nights with all of these day trips! Ah, cool – we loved Mexico City and Puebla. Merida is so different from those places but we hope you find it to be equally awesome! So glad to hear you found this helpful in your travel planning. There really is so much to do there. We had no idea during our first visit just how much there was to do in the area. You couldn’t definitely fill a week if you wanted to. Have a great trip and enjoy the Yucatan! This was seriously so helpful! I’m going to Merida next week, and this is the most detailed blog post (especially the travel information!) about day trips that I have found. I’m even more excited now! Yay! We’re so glad to hear this article proved to be helpful! Thanks for the kind feedback. We hope you have a great trip to Merida and throughout the Yucatan! Buen viaje! We talked about smash in Merida. I would love to do some of these day trips so kids could learn about Mayan Civilation and so much else. Take a look when rested. I’m not sure if this was intended to be a comment or an email to someone else. But either way, I hope it gets to the right person and you enjoy everything there is to do around Merida. What a great opportunity to introduce kids to the Mayan civilization! We loved staying in Valladolid too! Great as a base to Chichen Itza, lots of cenotes, and Izamal, among other places. Wow! So many trips I don’t know how to choose! I think i’d go to Campeche first because it looks like an amazing photography stop and then i’d probably head to the beach to get a bit of sun! Wonderful and informative post, John! I feel bad that I didn’t get the chance to explore the rest of Central America while living in South America. I’ve daydreamed countless of times about all the ruins, villages and cenotes scattered all over the Yucatan peninsula. I can’t wait to experience every bit of history, culture and cuisine of Mexico! Someday! Keeping my fingers crossed! Would you say that the country is safe for solo female travelers? Thanks for sharing all of this, John! Hi Trisha! We also hope that you make it to the Yucatan to experience all of it’s charms. From our experience here, we definitely think it’s safe for solo female travelers. Heather goes out all the time by herself with not the slightest of issues. We’ve found the Yucatan to be extremely safe and it is often cited as the safest state in all of Mexico! We hope you make it here someday but until then, happy travels! I just bookmarked your post! So many neat ideas on day trips. I’m definitely including the flamingos and the yellow city. It looks really cool! Great list! And once you’re done with the cenotes in Cozuma, you can try the ones in the nearby village of Homun. Thanks for the tips on the “less busy” ways to see Chichen Itza! When we visit the Yucatan, this is definitely something i would like to spend time doing (and photographing with less people around ahah)! Glad we could help! The Chichen Itza ruins get absolutely swamped with tourists in the middle of the day. Add to that the extreme heat and hundreds of vendors selling souvenirs throughout the entire site, and it can make for a unpleasant experience. We’ve found that it’s definitely best visited in the early morning. We were actually able to get shots of the entire pyramid without any other visitors. We hope you enjoy your visit to the Yucatan and have a great time at Chichen Itza! I love Mexico and I would love to explore this area further. I was bummed that I didn’t get to make it to Chichen Itza last time I was there! Although that’s the big-named ruin site here, definitely consider some of these other ruins too which we’ve found to be equally impressive and much more tranquil! I have yet to explore the Yucatan, but the Mayan ruins would be at the top of my list. I studied Mayan culture in college, and seeing the temples in person would be unbelievable. Add the Yucatan to your list and get down here 🙂 There are so many Mayan ruins that await your visit! This is super timely as I’m planning a trip to the Yucatan. I love that you include public transport options for all of these sites as well! So glad you caught this before your trip and hope it helps with your planning. Have a great trip and let us know if any questions! I was supposed to be heading out to Mexico next month but plans got changed. Hoping to make it out next year now so this will come in very handy. Thanks for such an informative post! Oh no, well we hope you do make it to Mexico next year to explore some of these awesome places. We’ve been in the country for over two months now and are absolutely loving it. I’d love to see Chichen Itza… and the flocks of flamingoes! What a great post with some beautiful photos! Thanks Tami! Chichen Itza really is impressive, as are the flamingos. Hope you make it over to the Yucatan to see these awesome sights first hand! Good job on your post… I have been to most of these spots and many others here in Yucatan, retired here from Canada 4 yrs. ago. Do day rides on my Harley to many interesting spots.. Keep up the good work! Thanks! That means a lot coming from someone living in the area. What a great place to live, by the way! And what an awesome way to get around the Yucatan… on the back of a Harley! Love it! !